NSCSW | A Discussion on Regulating Clinical Social Work. The Private Practice committee formed in June of 2017 to address issues withthe bylaws regarding the registration of private practitioners. In addition, social work private practitioners and their clients have continued to face barriers in ensuring coverage of social work services through insurance companies. Parallel to these concerns, members working through the public mental health systems have expressed distress about the current direction of Mental Health Care in Nova Scotia and the role of social work within this system. An agenda for the private practice committee was further defined at last year’s AGM, with a motion carried by the membership stated. explored relevant research on the topic. The survey revealed that the current regulation on private practice is unclear and that members perceived private practice to be clinical practice. Further to this, an environmental scan revealed that Nova Scotia is the only province that regulates private practice as a specific area of practice, but that provinces such as British Columbia, Alberta, and Saskatchewan have specific regulation regarding clinical practice. In the survey, there were certainly multiple perspectives on the issues. What the committee agreed is that the survey respondents believed the following. Having an MSW or PhD from an accredited school of social work is a necessary requirement for private practice. Five years of relevant social work experience is a necessary requirement for private practice. Supervision in an area of specialization is a necessary requirement for private practice. Conducting assessments for legal proceedings as a social worker requires an additional level of registration to protect the public. Clinical social work requires an additional level of registration to protect the public. The College should work to gain title protection of the title “Registered Clinical Social Worker” – this would mean a specific registration would be required to hold this title. The College should work to update the scope of practice so “Registered Clinical Social Workers” can legally diagnose using the DSM-5. The College should implement an exam to evaluate clinical competencies. With this, the committee has continued to examine the core issues in order to weight out what regulations are necessary to protect the public and which are not. Using an approach framed in right touch regulation the committee is leaning towards making a recommendation that deregulates private practice, but that puts proportional regulation around clinical social work practice. Currently, private practice is defined in the Social Workers Act as being “self- employed” which does not inherently mean clinical practice. The College’s Board of Examiners reviews applications for private practice, by examining resumes, letters of reference and years of experiences to assess if social workers have the competencies to provide social work services in the area of specialization that they have applied for. As social work has a large scope of practice, to define what competencies that are needed in each area of social work is problematic as each area of practice is going to be contextual, and relevant to the place of employment, clientele, and community. The private practice committee believes that this is an over-regulation and not in line with best practices or right touch regulation. At this time the committee is leaning towards recommending that the prescribed requirement and qualifications for engaging in private practice would be that a Registered Social Worker or Social Worker Candidate must be a member in good standing and only engage in private practice in the area where they are competent to provide the social work service. The opinion is that the current entry to practice requirements, including completing an accredited social work degree coupled with a declaration to adhere to the standards of practice and codes of ethics are sufficient tools to regulate private practice. However, the question of the regulation of clinical practice is something that the committee has continued to explore. The committee believes that clinical social practice is as an advanced area of social work that focuses on the individual and their relationship to the social, economic and political structures that impact mental health, emotional, and other behavioural functioning. Through the use of evidence-based modalities, clinical social work applies assessments, interventions, and prevention practices to achieve optimum psychological and social functioning. The committee believes there is a need to regulate clinical social work practice in order to protect the public. Currently, mental health care in Nova Scotia’s is embedded in a worldview that predominantly sees mental health as an “illness,” a psychiatric condition that occurs largely out of the blue in individuals who are genetically vulnerable, are uncontrollable and lifelong. This worldview flows from the medical model which diagnoses and treats symptoms for those who are severely ill. This model is problematic as it drives political decisions towards stacking resources into hospitals and emergency rooms as opposed to communities. This approach is not supported by recent research, which tells a more complex story of mental health. Social works grounding principles provide a framework for a different worldview on mental health care. This worldview presents alternatives to service delivery beyond the medical model. Often these approaches involve a postmodern lens that is client and family-centered, is built to avoid having the deficit-based, problem-saturated, and pathologizing language of the medical model and is rooted in strengths-based approaches to practice. These approaches work to ensure that clients voices and stories are valued above all else. Social Work and Mental Health Care. Since the late 1980s, social workers have felt a split between traditional social work values and medical model values. Social workers often feel a tension between who they were trained to be and who they are forced to become in order to remain in the workforce. 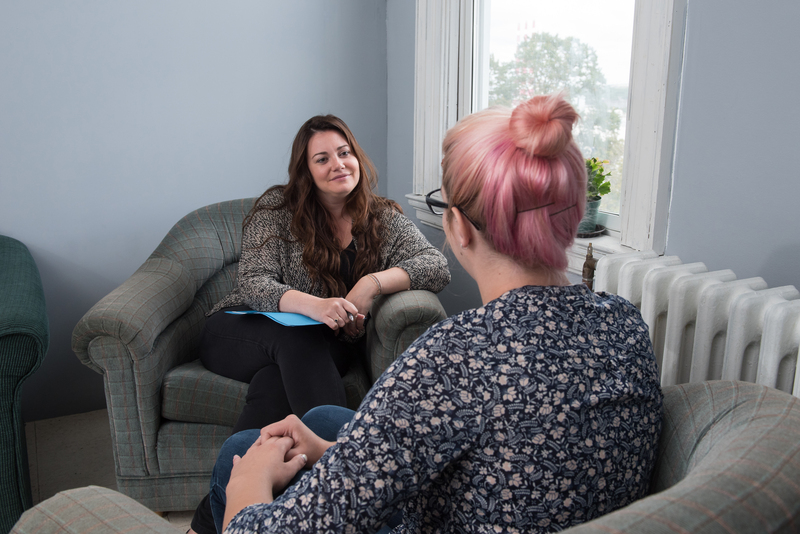 This tension is often felt in Nova Scotia, social workers in mental health care settingshave expressed concerns to the Council of the College that it feels like social work is being pushed out of the mental health care system. In addition, private practitioners have expressed frustration with insurance companies who often do not cover the cost of social workers providing mental health care services. More and more the competencies required for clinical social work practice are being defined through the lens of the medical model rather than the values of the profession. This creates challenges for the development of the social work professional identity within the mental health care setting. It often leads to internal tension and question such “What is the role of social work in mental health care?” “How do our professional values fit and guide our actions within this setting” and “How do we best collaborate with other health professions through social works unique practice lens?” This erosion of professional identity can lead to ethical dilemmas, burnout which ultimately puts the public at risk. The committee believes that social work professionals are best situated to define the minimal competencies required to practice as a clinical social worker. That this process will more clearly define the professions role in Nova Scotia within the mental health care system strengthen our professional identity, strengthen ethical competent clinical practice and better protect the public. Towards a Clinical Category of Registration. Given the current situation in the Mental Health Care, the Private Practice committee is considering making the recommendation that the NSCSW regulate clinical social work practice by creating clinical category of registration. Instead of assessing and authorizing practice in each area of clinical specialization, the committee is considering recommending that the College set minimal requirements for clinical social practice. The committee is considering recommending that the NSCSW set the minimums requirement of. An MSW from an accredited school of social work. A passing mark on the ASWB clinical exam. A minimal amount of supervised clincial practice experience. Complete a policy paper with more a detailed rationale for the recommendations. Throughout the month of March (social work month!) travel the province to consult with members on these proposed changes. We can begin the conversation today on this Blog Post. If you have questions, thoughts, ideas please post below. We look forward to the engagement process ! Lots to ponder here. Obvious a lot of thought has been put into this. How are social workers being “pushed out” of Mental Health care system? Under same topic, who is responsible for defining practice “through the lens of the medical model rather than the values of the profession”? Specifics help some of us to buy in. And, the bullet point about diagnosing using DSM-5 strikes me as odd. I practiced for close to 20yrs in the public mental health system & I did diagnose using that resource. In fact we had to assess and diagnose before offering any treatment, of course. It is by the way pretty much a medical model instrument so if we don’t want to practice at least in part through that lens, why do we want to use that instrument? A final and overarching consideration, I would hope NSCASW is consulting all the other provincial social work bodies as well as CASW in these undertakings as the challenges must be national, e.g.insurance coverage for private practice. Hello, I am interested in the discussion as someone in a private practice that has shifted over the years from a “structural” type community based work to now more of a “clinical” practice. I am curious about a couple of things. 1. what is “A passing mark on the ASWB clinical exam” and would there be a grandmothering in process for us who have been registered in clinical practice for many years on the fringes of or in opposition to the mental health system without actually embracing or desiring to endorse in any way the DSM or its categories. 2. what about cultural humility/safety/competency/sensitivity for clinical practitioners in service to Indigenous and other culturally diverse peoples. As an Indigenous person, often in-service with other Indigenous persons, they are often harmed rather than helped by DSM, mental health and well-meaning social workers operating from a deficit model. Right now I can fly under the radar and offer a culturally appropriate and specific service to those clients that require it, and I was to be sure that I will still be able to do that as a RSW is a requirement for providing service through FNIH. 3. What is the NSCSW currently doing to lobby insurance companies like Great West Life, and Desjardins (Gold Mine Provider) who fund psychologists and many other types of providers, to fund social workers as providers? It seems that resolving these barriers will require advocacy about the efficacy and legitimacy of social work practice through educating the decision makers in these companies. This would be a great service to all of us in private practice, but in particular for those of us in a rural practice trying to provide service to a particular geographic area as well, especially as it forces potential clients to travel into the city, generally at their own expense, for services when they would rather receive in their own geographic area. Hi Nancy lots to ponder indeed. The “pushed out” comment is coming from members of the profession who are working with the system and are continually feeling pressured to operate from a medical model perspective rather then from a post-modern, family and client-centered lens. In addition to this, the NSHA has done much work on their mental health strategy and through this work they have defined the competencies that a clinician would require for mental health positions, many of this competencies are defined through that medical model lens. The responsibility for defining the practice in my mind would come through the collective voice of professional and clients that they serve, rooted in principles of best of practice. In Nova Scotia, the only professions who can provide a “legal” diagnosis for mental health are psychiatrist and psychologist this is defined in professional acts. Social workers who feel competent using the DSM-5 have always been able to give a preliminary assessment, but the ability for this to be an “official or “legal” diagnosis is not currently not in the Social Workers Act. The question was asked in the survey, too engage conversation about this and respondents indicated that they felt this is something we should strive for. It warrants conversation as you are right it is a tool of the medical model. In addition, this would require more reflection and legislative changes. Advocacy to insurance companies continues to be an ongoing focus with our national partners. What we have learned through these consultations is that the most successful advocacy is done by communicating with the employers who buy the benefit plans for employees. We have learned that if they name social work as a profession that should be covered in there plan, then insurance companies will do this. as always thanks for engaging! Hello Frye, the ASWB requires that you answer 60% of the questions right to pass the exam. Yes, I believe that if we were to move forward with this shift there would be a period of grandparenting. I think you raise a valid concern about cultural humility in clinical practice. The ASWB exam measures minimum competencies, and in my mind would not gauge if someone had the competencies to provide services through a cultural lens. The exam is far from a perfect tool, but the committee feels it is reliable, valid, and tested tool to measure minimum competencies and is worth discussing. Finally, in term of advocacy, work has been done to plan for an advocacy strategy. Advocacy to insurance companies continues to be an ongoing focus with our national partners. What we have learned through these consultations is that the most successful advocacy is done by communicating with the employers who buy the benefit plans for employees. We have learned that if they name social work as a profession that should be covered in there plan, then insurance companies will do this. I am SO glad to the college is finally publicly recognizing these issues and is proposing a clinical social work designation. The lack of competency in private practice is often concerning and leads to issues in ethics and public persona. While I agree that social work is unique from psychology and should continue to promote and practice different values, as both a member of the public mental health system and as a private practitioner I believe we also need to be able to diagnose and provide evidence based treatment to the clients we serve and gain more acceptance with insurance companies. I fully support a licensed exam and more stringent requirements for a clinician designation. I am surprised to see a 60% passing mark (seems low as I would not want my doctor to have passed their studies with this mark). I think this designation accommodates the field to allow clinicians who are lean toward this model to participate, and ones who don’t to opt out. Hi Jessica, the pass rate of 60% is set by the ASWB, I do believe that if we go this route we can set a higher rate. Much to discuss still! A separate licensing process for clinical social workers (and the capacity to diagnose) may indeed lead to more insurance companies providing coverage for our services. However, some of the other arguments for supporting this are certainly debatable. A clinical designation might create the perception (to the public and other professions) that social work practitioners are more effective, more likely to provide evidence based treatments or more likely to practice in an ethical manner. But this would simply be a perception without any supporting evidence. Meta-analytical research of outcomes in clinical practice continue to show that clinician characteristics (age, gender, years of experience, level of education, certifications, licenses, etc.) have no impact on outcomes. Similarly, the clinician’s model of practice or theoretical orientation has no bearing on outcomes. – the means and methods used by the clinician are a good fit for that particular client. It should be no surprise that the most effective clinicians (regardless of profession) are those who are particularly gifted in creating a strong therapeutic alliance with a wide range of people. If there is a licensing process that shines a light on those skills, then I’m all for it. My fear is that the licensing process we’ll end up with is one where applicants must be knowledgeable in problem-focused, diagnostic driven approaches that dominate our mental health services. To be successful, one will have to be fluent in the dominant language of this system. While this will enable us to bill more insurance companies and perhaps gain more respect from other helping professions, it won’t necessarily lead to better clinical outcomes. As clinical social workers, I think there is an opportunity for us to do something different here (and the ASWB exam would not be part of that, in my opinion). Part of this effort would be having more dialogue about what ‘clinical competency’ means and how (or if) it can be measured appropriately. If we follow the path of the dominant culture in the mental health professions, the only outcome I can foresee is that some social workers will make more money and some won’t.